Boy lays his head on the soldier, lovingly licking his face with his coarse, wet tongue. Patting the dog, the soldier allows Boy to lean into him and nuzzle him affectionately while bombs and gunfire explode in the distance. Sighing heavily, he hugs Boy, pulling him closer for more comfort. He presses a piece of cloth that was ripped from his undershirt, trying desperately to stop the flowing blood. Thank you to Pixabay.com for the photo prompt today. 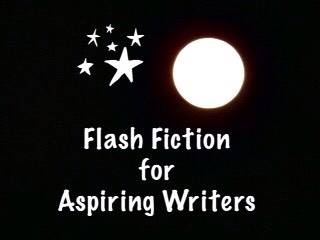 This is my 100 word story submitted for the flash fiction challenge, Flash Fiction for Aspiring Writers. We are given a photo prompt and approximately 75-175 words with which we create our stories. This challenge is open for all who would like to participate. For more information, click here. To read all the other wonderful stories written for this challenge, click on the blue frog button below. A profoundly sad and deeply moving story, Priceless Joy! I loved it. Thank you so much!! I appreciate your comment. Thank you so much Shivangi! I hope he survives too. (I think he will). Oh! In just a few words, you are able to make me feel for them. Such a touching tale, PJ! Thank you so much, Rosema!! Short piece, but so powerful! I think you did a great job of conveying so much emotion so quickly. Hope he makes it! Thank you so much, John! I think he will survive because he promised the dog. Thank you for your feedback!! Aww… a true “man’s best friend.” Very poignant and well written PJ. 🙂 🙂 This reminds me of the book, Soldier Dog, too. Thank you so much, Maria! I appreciate your comment. I haven’t read this book, Soldier Dog. It sounds like it would be a good book! My pleasure PJ.. 🙂 🙂 🙂 I haven’t read the book yet too but it sounds interesting when I heard people talking about it. Yes! Trouble is, I haven’t written the books down and I have forgotten what is on my list. LOL!! It was really long but it suddenly got really short. I have to start all over again. Hahahaha! That’s what happens to your brain when you get older – it starts shrinking! LOL! No, really, I heard that as you get older your brain shrinks. Haven’t you seen old people that look all shrunken up? (I’m not THAT old yet, thank goodness!). Our brains shrinks a little bit too. All that wonderful information we learned over the years get all shrunk up and jumbled up inside and it’s hard to find answers because you have to go “fishing” for it. Sometimes it’s hard to get a hold of those little swimming pieces of information! LOL!! Hahahahahahaha! (I’m full of bull). Hahahahaha! I literally googled, “Does your brain shrink as you get older?” after this. XD That’s a scary and funny thought PJ- imagine those pieces of information jumbled and swimming inside a shrinking brain!! Hahaha. But study does shows that certain parts of the brain shrink, especially the prefrontal cortex (an area at the front of the frontal lobe) and the hippocampus. Both areas are important to learning, memory, planning, and other complex mental activities. Hahahaha! And here I thought I was just having a little fun but I was right after all. Hahahahaha! I honestly do feel like I have to go “fishing” for information in my brain now whereas it once was easily available. It is the sad part of aging…memory loss. Older adults need to keep their mind active by doing activities that stretch their thinking. For example, cross word puzzles and games that make them stretch their minds. Some memory loss just can’t be helped. Exercise will be good, too. Yes, mind games do help! When my mother was put into the rehabilitation hospital they played a lot of mind/memory games with her to help her thinking. Hahaha! I’m sorry, Maria. I didn’t mean to scare you. I was just spinning a fish tale. 😀 😀 It isn’t as bad as I have described it. Keep your brain active and you won’t have any problems. Hmm… it’s a good thing that blogging keeps our brains active, right? Yes, blogging and especially writing/writing stories help keep the brain active and stretch our minds. Yes, me too! 😀 Reading blogs really stretch our minds because we are learning so many different things. Thank you, Charly! Yes, dogs do save the lives of many people. Sometimes just by being there for them. Very moving story. I hope help arrives. Thank you, Ali! I hope help arrives too. (I think it will). Oh Priceless…..I just want them both to be okay, together. Thank you so much, Colleen! I hope they both survive too! (I think they will). I just dont know if I can read these. But I will. Oh Ellspeth, I’m so sorry these may be hard for you to read. I hope they aren’t too depressing. No need to be sorry, PJ. I’m just a mush face 😛 I’m actually enjoying the stories – even the sad ones. Good thing the dog is there… Very poignant – good stuff, PJ! So many sad stories this week. The story seems to bring that out in everyone. Thank you so much! I do hope there are some happy stories! Thank you, Funsie! I’m sorry it made you sad. I hoped it would make you hopeful. He is wounded, but he will survive. He promised, Boy. The image does invoke sad stories and thoughts but I hope there will be some happy stories too. I’m the same way! LOL! Oh… And I banned myself from watching dogs related movies ‘cos one box of Kleenex is never enough. LOL! Hahaha! I understand, completely! I have a very soft spot for animals too. Nice build up to the climax. That last line really packs a punch. Well done. Thank you so much! I really appreciate your feedback!! Thank you, Angie! I think that they will. Thank you so much, Lynn! I’m so glad you enjoyed it – that is my goal! So beautiful Joy. These dog’s are more than dogs. They are life savers. I agree, Jacqueline. They are life savers! I love it when you pull something out of the hat in the very last sentence PJ! Great story! Thank you so much, Uday!! Sweet and short story that depicts the greatest bond of all time… Friendship… ❤ it. Such a well written piece. I’m glad boy stays to comfort the soldier, it probably helps keep him alive. I’m glad they take of each other. I’m afraid for the fate of this soldier. Thank you, Mandi! The soldier promised Boy that he would stay alive, so I think that he will. Short and tragically sweet, PJ. You invoke emotions in so few words, well done! Thank you so much, Terri! I appreciate you reading and commenting. Animal stories kill me! I don’t flinch when I see someone shot on TV, but when they shoot the dog–oh no! Thanks for choking me up! 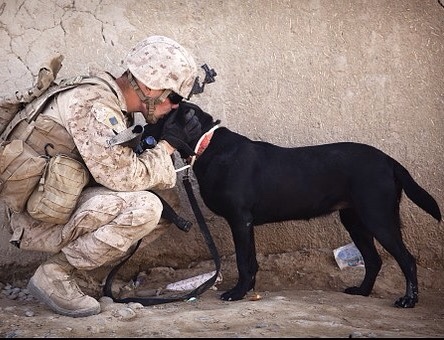 Animals are a comfort in everyday life but that must be tripled in war. Very beautiful piece! Thank you so much, Carol. I would think that would be the case too. Thank you Ameena! Yes, they both live. The soldier lives because of Boy. What a moving story, Joy, so raw and real. Thank you so much, Oliana! So much said in so few words.. well done!